BARBATUS (BARBAS), a native of Benevento, ordained to the priesthood at an early age. St. Barbatus quickly gained a reputation as passionate preacher whose zeal soon earned the enmity of his flock. 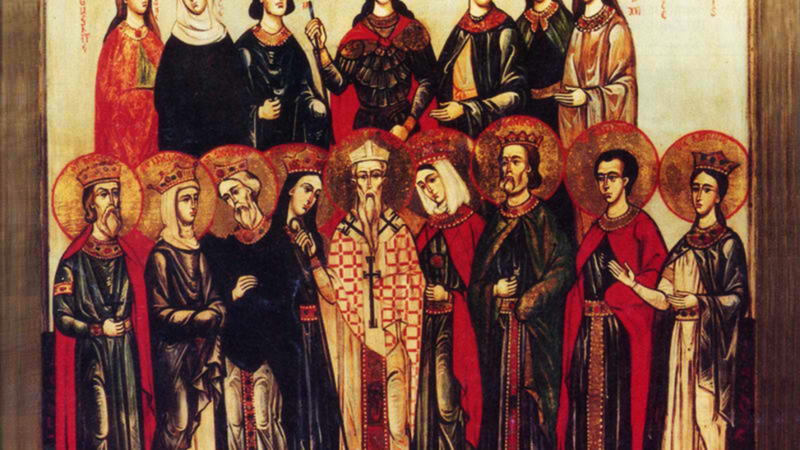 Forced to resign his parish, St. Barbatus returned to Benevento, there he encountered a pagan resurgence combined with a defiant citizenry when exposed to the Gospel. Soon, completely unrelated to the issues in the city, Benevento found itself under siege by the forces of Emperor Constans II (r. 641–668). This crisis made the population renounce their paganism and embrace Christianity. St. Barbatus assured his flock the siege would end, and it did. After the siege, St. Barbatus was chosen to succeed the Bishop of Benevento, who had perished in the siege. As bishop amongst other activities, St. Barbatus attended the Sixth Œcumenical Council (680–681), at which the Monophysite heresy was condemned. St. Barbatus reposed in 682. BEATUS, a monk at the Monastery of Santo Toribio in Liebana, near present-day Santander Spain. St. Beatus and was famous for his writing and preaching which unflinchingly condemned the heresy of Adoptionism. Following the abandonment of this heresy, St. Beatus retired to the monastery of Our Lady of Valcavado, in the province of Palencia. There he wrote his celebrated Commentary on the Apocalypse . St. Beatus reposed in 789. GEORGE of LODÈVE, a monk at the Abbey of Saint-Foy-de-Conques in present-day Occitanie, France. Following the destruction of the abbey in 862 by Vikings, St. George relocated to the nearby Abbey of Vabres. Towards the end of his life, St. George was consecrated Bishop of Lodève, Languedoc. St. George reposed circa 884. MANSUETUS, consecrated forty-first Bishop of Milan circa 672. He is remembered for revitalising his See and for authoring a controversial treatise against Monothelitism. St. Mansuetus reposed circa 690. ODRAN, whilst he is traditionally believed to have been St. Patrick’s (17th March) charioteer and the first Irish martyr, circa 452, there is no reliable information on this saint extant. PUBLIUS, JULIAN, MARCELLUS, and COMPANIONS, (Date Unknown), martyrs in North Africa of who there is no further information extant. QUODVULTDEUS, Bishop of Carthage in North Africa, exiled, along with many of his clerics, to Naples after the Arian Gaiseric, King of the Vandals (r. 428 - 477), conquered Carthage in 439. After arriving in Naples, St. Quodvultdeus and companions set about ministering to the population. He reposed in Naples in 450 and was quickly acclaimed a saint by the population that had witnessed his patience in the face of adversity. VALERIUS, the second Bishop of Antibes, he reposed circa 450.